The Emmy Award is an American television production award focused on entertainment, and is considered in equal prestige to the Oscars. Since 1949, the Emmy has represented the pinnacle of prime-time television excellence for the Academy of Television Arts & Sciences. 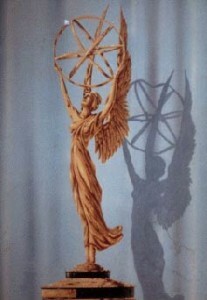 After rejecting 47 proposals for what was to become the Emmy® statuette, Academy members in 1948 selected a design that television engineer Louis McManus had created using his wife as a model. The statuette of a winged woman holding an atom has since become the symbol of the Television Academy’s goal of supporting and uplifting the arts and science of television: The wings represent …. …the muse of art; the atom the electron of science. Each year, the Television academy contracts to have approximately two hundred statuettes produced for the prime-time awards show and the three hundred for the regional awards. Although the numbers of categories rarely change, the possibility of multiple winners prompts the Academy to order extra statuettes. Surplus awards are stored for the following year’s ceremony. Three related but separate organizations present Emmy Awards. The Academy of Television Arts & Sciences honors national prime time entertainment excluding sports. The National Academy of Television Arts & Sciences recognizes daytime, sports, news and documentary programming. And the International Academy of Television Arts & Sciences honors programming originating outside the United States. The best-known of the awards are the Primetime Emmys, and the Daytime Emmy Awards, with both having categories classified as Creative Arts Emmys. The first Emmy Awards were presented on January 25, 1949 at the Hollywood Athletic Club. Shirley Dinsdale has the distinction of receiving the very first Emmy in the first awards ceremony. The Primetime Emmys are presented in recognition of excellence in American primetime television programming. Ceremonies generally air in mid-September, on the Sunday before the official start of the fall television season, and are currently seen in rotation among the ABC, CBS, NBC, and FOX network. 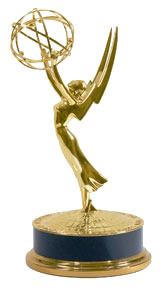 The Daytime Emmy Awards are presented in recognition of excellence in American daytime television programming. The first daytime-themed Emmy Awards were given out at the primetime ceremony in 1972, but the first separate awards show made just for daytime programming was not held until 1974. The Sports Emmys are presented for excellence in sports programming. The awards ceremony takes place every Spring, usually sometime in the last two weeks in April or the first week in May, and is held on a Monday night in New York City. Technology & Engineering Emmy Awards are presented to individuals, companies, or to scientific or technical organizations in recognition for their significant developments and contributions to the technological and engineering aspects of television. There are twenty chapters of the National Academy of Television Arts & Sciences, located across the United States, that conduct regional awards to recognize excellence in all the regional television markets. Because the headquarters of the Academy of Television Arts & Sciences are located in Los Angeles, the Academy also handles the Los Angeles area membership and regional awards. These awards are less glamorous than the Prime Time Emmys and are sometimes technical. The Regional Emmy Award is 11.5 inches (29 cm) tall with a base diameter of 5.5 inches (14 cm) and weight of 48 oz (1.4 kg), as opposed to the Primetime Emmy, which stands 15.5 inches (39 cm) tall with a base diameter of 7.5 inches (19 cm) and weight of 88 oz (2.5 kg). For information please visit the following link of the Academy of Television arts & Sciences http://www.emmys.tv/index.php. Special thanks to wikopedia.com for contributing information. This entry was posted in Uncategorized on September 1, 2009 by admin.